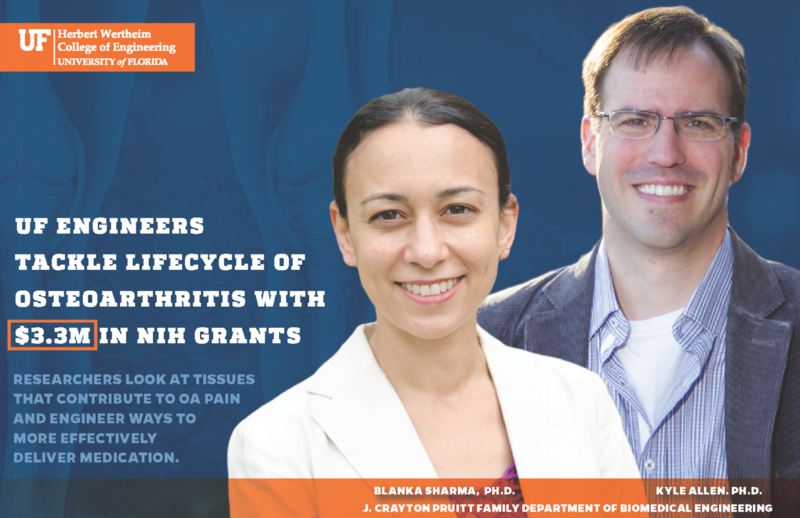 Osteoarthritis (OA) is a complex disease that attacks human joints, but now two University of Florida researchers from the Herbert Wertheim College of Engineering are counter-attacking. Their focus goes deeper than alleviating the pain caused by OA. With the support of two National Institutes of Health grants totaling $3.3 million, they are concentrating on the underlying pathology that causes the pain and how they can protect the cells that form joint cartilage. Dr. Blanka Sharma, assistant professor in the J. Crayton Pruitt Family Department of Biomedical Engineering, and her collaborators, Dr. Kyle Allen, BME associate professor, and Dr. Wendy Liu, associate professor of biomedical engineering at UC Irvine, are developing a new drug delivery system to protect joint cartilage and reduce inflammation of the joint linings. “There is a need for essentially different types of drugs in different locations within the joint,” Sharma said. A $1.57 million NIH grant is helping the team look at different timing and delivery routes for two OA drugs. Kartogenin, a drug that has been shown to protect the chondrocytes (cells within the joints), will be delivered directly to the cartilage as part of this study. Another molecule that will be introduced to the joint is CD200, which has been found to steer immune cells towards anti-inflammatory behavior. To reduce the need for frequent injections due to rapid clearance of drugs from the body and to localize drugs to their target tissues, Sharma aims to deliver drugs attached to micro- and nano-size particles made from biocompatible polymers. Kartogenin-coated nano-particles will be “painted” directly onto cartilage with a sealant, while CD200-coated micro-particles large enough to limit their clearance will be injected directly into the joint cavity. These two methods will be studied in preclinical OA models, both separately and in combination, to reveal whether simultaneous delivery can affect OA more than either of the treatments alone. 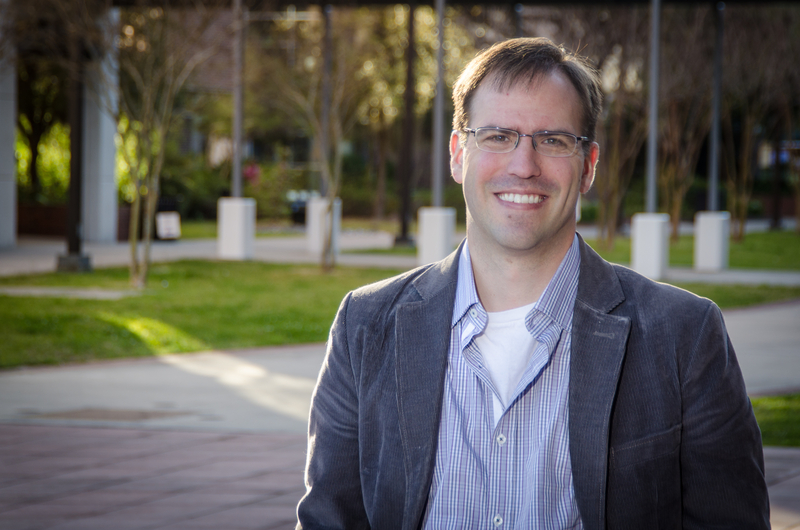 Dr. Kyle D. Allen, associate professor of the J. Crayton Pruitt Family Department of Biomedical Engineering, will investigate the conditions of several tissues as OA symptoms improve or deteriorate with the support of a $1.8 million grant from the National Institutes of Health. 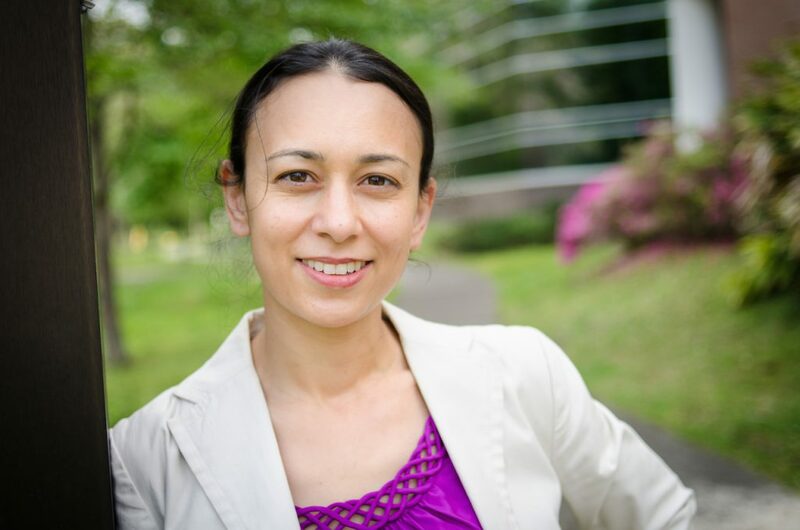 “This grant is focused on trying to look beyond the [joint] cartilage to see what changes in what tissues are really driving the symptomology of OA,” Allen said. The preliminary OA models studied in this research will concentrate on non-cartilage factors potentially contributing to OA symptoms, including bone structure, inflammation and neural sensitivity. “Exercise is one of the most clinically effective forms of OA management. Exactly how exercise elicits improvement in the first place is not yet completely understood,” Allen said. We will study exercise in the models to analyze tissue changes during improvement of OA symptoms. Although effective, exercise can be difficult for some patients due to OA related pain. Findings from this study could bring about new drug targets to help alleviate symptoms and make it easier for patients to reap the benefits of exercise.